1. This original ZP35B rotary tablet press utilizes hydraulic system for adjusting pressure according to different tablets, setting oil pressure to meet the requirement of overload protection. The HAWE high pressure valve from Germany keeps reliable stability. As the cylinder swings in the pressing process under the radial force, the positioning system is mounted on one side of the cylinder on the rack of compression roll, extending the operating life of the cylinder. 2. The latest hydraulic ZP35B rotary tablet press adopts the PLC programming unit and touch screen with digital display. Configured with USB port, it is able to collect the data of working status effectively. 3. The air spring and the hinge for opening the four organic glass doors are transferred to the top of the entire machine. Therefore, this pressing chamber becomes tidy, bright and easy for cleaning. The possibility of cross contamination is greatly decreased. 4. The pressing chamber is structured with integrated stainless steel panel instead of spliced ones. Dust of materials is effectively prevented to enter the mechanical devices below the pressing chamber, increasing the reliable performance of these devices. 5. The main shaft and the gear shaft are coupled by involute spline, facilitating the machine to run stably and durably. 6. If customers require specially, dustproof and grease proofing ring can be added to reduce the black dot on tablets effectively while pressing, improve lubrication and reduce abrasion. 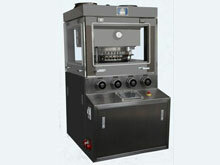 1.This rotary tablet press is a double-press machine with single side ejection. ZP dies help to press the granular materials into circular or irregularly shaped tablets. Added with dedicated auxiliary devices, it can output double-layered tablets. 2. Weight control unit is adopted to keep stable precision difference on weight of tablets. 3. The completely closed housing and all the parts in contact with medicine are made of stainless steel or some of them are well treated on surface, functioning corrosive resistance without poison generation. 4. Surface of the turret is specially treated to guard against cross contamination. 5. This rotary tablet press possesses a pressing chamber structured by transparent organic glass all around. This chamber can be opened thoroughly for ease of internal cleaning and maintenance. Safety lighting fixture is assembled in the chamber. 6. Continuously variable speed regulation device is applied. 7. Reasonable design of hydraulic system improves systematic stability. 8. Overload protector leads to automatic shutdown of the machine when the pressure is overlarge. While mounting and dismounting dies, dedicated protecting device is adopted to keep operators safe. 9. This ZP35B rotary tablet press is updated from ZP35A machine. With precompression and main compression for tablets, it is able to improve the quality of tablets significantly. The maximum production capacity of ZP35B pharmaceutical tablet press is 150,000pcs/h. Besides this double -press machine, FEIYUN, as a professional pharmaceutical machinery manufacturer, offers medical high purity nitrogen generator, pharmaceutical tablet coating machine, capsule filling machine, medicine pack blister packaging machine, and more. If you want to buy high quality pharmaceutical equipment, please let us know and we are able to provide you with pharmaceutical machines in line with cGMP standards.